Need to transfer files from Android to iPhone? After searching the internet, you can get various ways to copy Android files to iPhone totally for free. For example, Google Gmail can help you transfer files from Android to iPhone, but only contacts, emails, notes and calendar. iTunes allows you to transfer files from Android to iPhone, but you need to first get all wanted files from Android to the computer and then to the iTunes. Finally, you can transfer the exported files to the iPhone. Moreover, only those purchased items can be supported with iTunes. See? There is no such thing as free lunch! You need to pay more time and energy! Here, this Phone Transfer software allows you to easily and directly transfer files from Android to iPhone. 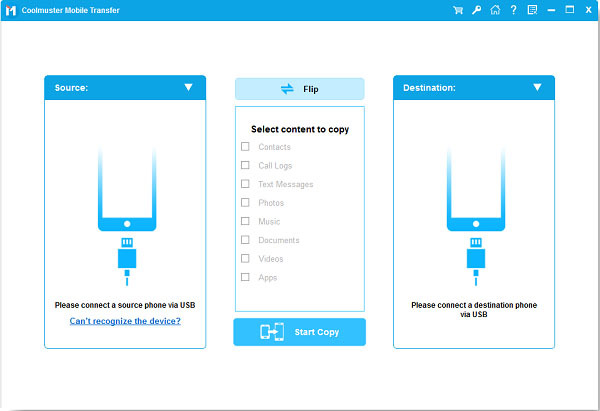 With this software, you are free to directly copy Android files to iPhone without a third-party tool. Various files can be supported, including contacts and eBooks (PDFs and ePubs). And this software is quite easy-to-use! All you need to do is follow the steps as instructed. Still have any doubts about what I've said? Why not get the free trial version and try it out by yourself? Just remember to get the right version on your computer! Step 1. After opening the installed software on the computer, get the two devices connected to the computer via the USB cords. Then, you can see the below interface. Step 2. Now, you can see different file folders are arranged on the top panel. If needed, please click "Flip" button to change the position of two devices. Step 3. While previewing, tick out the files you want to transfer from Android to iPhone, such as Contacts and Documents. Finally, hit the "Start Copy" button to copy Android files to iPhone. With this Phone Transfer software, transferring files from Android to iPhone is just a matter of a few simple clicks! So what are you waiting for? Just get the right version of this software and give it a try!